How to wash a car: a voice of reason just entered the room! How to wash a car is as much about "how to do it" as it is "what to use to do it". I am amazed at how many people continue to get this very basic requirement of car care completely wrong. 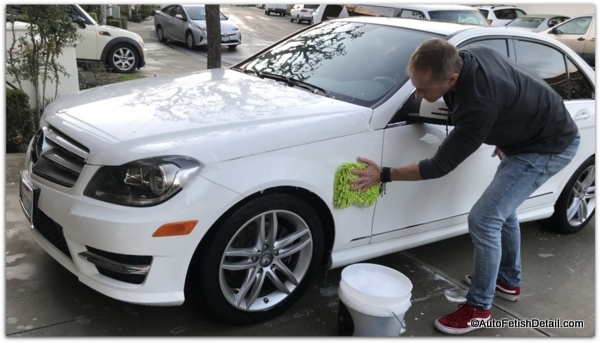 While many enthusiasts look forward to an entire afternoon in the driveway washing and pampering their pride and joy, most people consider car washing a necessary evil. Out-dated methods of car washing are not only causing you unwanted frustration, but most likely causing you to procrastinate your car washing duties to an ungodly length of time at which point you cave and resort to desperate measures that prove ineffective and possibly damaging to your car. "Whether you look for excuses to wash your car or consider car washing a necessary evil, I am going to show you not just proper technique, but provide a rational alternative of how to wash a car." The do's and don'ts of how to wash a car. Products and techniques for superior results. Tips that you won't hear anywhere else. As a mobile detailer I get around. I see lots of neighborhoods; both residential and commercial. What I continue to see is lots of people performing their car washing duties in really bad ways that produce marginal results. As a starting point we need to lay out some simple rules of the car washing game that we can then build upon. 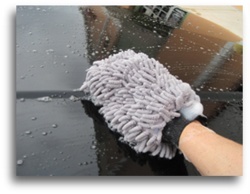 The more dirt you allow to build-up on your car, the more damaging it will be to remove; regardless of methods! It is silly and unrealistic to think you can get months and months of dirt off your car without doing some level of paint scratching. And don't become even sillier by talking about how you would never allow a car wash to do it because you don't trust them not to scratch your car; if you really were that concerned you wouldn't allow mounds of dirt to pile up! Dish washing soap does work, but it also works in stripping your car of any wax that may actually be there! I don't recommend it and it is harsh on your cars clear coat/paint. Bath towels might feel nice on your skin, but are completely inferior to modern day micro fibers and chenille drying cloths. They also leave much lint and will mar and scratch your paint. Local car washes with the big, round automatic brushes in the wash tunnel are not recommended. Search for an all cloth or 100% hand car wash facility if you are unwilling to wash your car yourself. Yes, using the squeegee at the gas station to "wash" your car will scratch your paint and you look like a lazy and silly person doing it! Do you really need to publicly display your ignorance and laziness. I love bundled products. Not only do they prove more economical as a rule, but saves me time in sourcing all the various products and tools necessary to complete a job. Darren's Professional Tips: Chemical Guys has an extensive line-up of products and so far everything I have tried has proved to deliver professional results. When it comes to car washing despite the endless chatter of opinions, you really don't have to over-think it. This car washing kit has everything you need to wash your car including the very useful "tool" called the grit guard insert that helps separate dirt from your wash water. This kit also has additional chemicals and products you will find useful in how to wash your car. I love car washing kits like this exact one as you covers all the essentials, allows you to try products you may normally not purchase independently, and you save money in the process. If nothing else, for the love of Pete, get yourself a decent drying cloth. That bath towel you have been using is doing more harm than good. A hugely popular drying cloth for car washing. Say good-bye to lint and scratching from your 100% cotton bath towel you have lead to believe is so safe! Darren's Tips: If I was making a decision for you I would pick the quick Wash Bucket kit at the top. Not only does it come with everything (yes, it does cost more), but it actually comes with the specific tools I consider to be more safe and effective at washing your car; after all, how to wash a car is more than just the "how to do", but also the "what to use'. You think hand washing your car yourself is the best and only way to do it. You spend a minimum of an hour (and probably much more time than this) during your time off during the weekend washing your car. After an hour or more you are tired and exhausted, so you pack things up and call it quits. A Better Way: Let me offer a better solution for you. Either switch to the dry wash method if you don't allow your car to get too dirty in between washing's, or find yourself a quality car wash and let them do your grunt work for you. Yes, quality car washes do exist; find one and go during off-peak times when no line exist. Yes, the chances exist that the car wash could scratch your car, but so could you. Buy back that hour of time and effort by letting someone else wash your car, then go home and do some real "damage" on your car with waxing, polishing, clay bar use, etc. These are tasks that will really make your car shine, are more "fun" to do, and will really help maintain the value and beauty of your car! The heated debate of how to wash a car, car washing products, doing it yourself, etc., etc. will rage on forever! Visiting any car or detail forum will quickly overwhelm most of you. you don't have unrealistic expectations, you just want to know what products will provide quality results without breaking the bank or breaking your back! 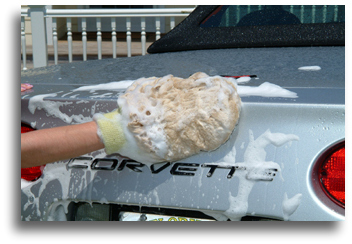 So pick and choose among my car washing tips that come from decades of both personal and professional experience! Use any of the secure Amazon links and help support the efforts of this site. I do in fact get a small commission every time you use the links within this site to make purchases with. I thank you in advance! "EXPERT TIPS, TRICKS, AND SECRETS FROM THE WORLD OF PROFESSIONAL DETAILING"